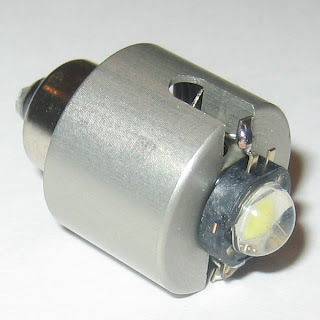 The Terralux Ministar5 is a dropin module for C and D cell Maglites, there are two versions: the TLE-6EX for 3 to 5 cell lights and the TEL-6EXB optimized for 2 or 3 cell lights. The dropin changes the incandescent bulb in the Maglite to a SSC P4 LED, a very efficient and bright led capable of producig 140 lumen of output. Runtime is variable depending on the number and type of cells of the original light. The module is regulated so the light output will be constant regardless of the state of the batteries, when the batteries are almost depleted output will decrease to offer some useful light for some hours, this avoids getting no output at all suddenly and is a good idea because carrying spare C or D batteries is heavy. The beam is excelent and retains the original Maglite focusability, the throw is as good as in the incandescent beam or longer and the sidespill is useful. The overall brigtness of the dropin greatly exceeds the incandescent version so brightness, runtime and lifetime are improved at the same time making the upgrade an option to consider if you already have a C or D Maglite in your kit. You can get it for $25 from Lighthound. The Meadowlark is small folding line produced by Spyderco for its child brand Byrd. The Meadowlark is 6 7/8'' long overall, the blade measuring 3'' (76mm). The total weight is 4 oz (116gr). The blade is made of 8Cr13MoV steel, it is very sharp from the factory and cuts very well, sharpening and edge retention are very good for this kind of steel. The lock mechanism is a backlock the dent in the handle acting as an extra safety feature that makes almost impossible to accidentally release the lock while handling the knife firmly. As tested in other Spyderco/Byrd knives this kind of lock works very well. The handles are made of steel, they are nice to handle but can get slippery in humid environments or if your hands are greasy, the comet shaped hole is used to open the knife with one hand operation, the hole works well and it is larger than other similar thumbholes. The Meadowlark has a steel clip to carry the knife either tip up or tip down, the clip is firm but not very hard to clip and unclip the knife, it may have a little play after several months of use but can easily be readjusted. The Meadowlark is a nice EDC knife without outstanding features but serviceable and very affordable, the excellent lock makes it safe to use and the construction should last many years. You can read more and order for $28 from Spyderco.